I chose to become an arbitrator after thirty-five years of practicing in the field of labor and employment law as an advocate and counselor. Being a part of the process of bringing justice and fairness to resolve controversies is something that I very much wanted to do after retiring as a senior partner in a nationally known labor and employment law firm. Having argued cases and advised parties from all sides, I fully realize the importance of being completely neutral and resolving matters by applying the law and basic principles of fairness. This is a challenge that I welcome and enjoy. During my years as an advocate, I represented employers, employees and unions. This experience varied from complex litigation in court and arbitration to basic advice on the entire spectrum labor and employment law matters. This experience also taught me to understand how parties react to controversy and litigation. Much of proper representation of a party is to counsel them so that their expectations regarding litigation and dispute resolution through arbitration are realistic. Neutrals in the labor and employment field who have never been advocates can not fully understand the context of a dispute and the reactions of the parties to it. Neutrals are not able to observe the behind the scenes laying bare of feelings by parties that advocates are. I have used my extensive experience as an advocate to better understand what is really going on as a case is laid out before me. Having been an advocate, I also fully understand the role of an advocate in arbitration. I see part of the role of an arbitrator as being understanding and helpful to each advocate so that they can do the best job for their respective clients. I know the difficulties they face in both satisfying an anxious client as well as vigorously representing that client. I work with the advocates to make sure that all of the relevant facts and arguments are brought out at the hearing. I also give advocates an indication of what facts and arguments I see as important as the case is proceeding so that they can appropriately tailor their presentations and post-hearing briefs. I believe that it is important for each advocate to have a full opportunity to address the facts and arguments that I am considering. Now having arbitrated dozens of cases, I find being an arbitrator very rewarding - from setting the initial ground rules to handling the hearing and then analyzing the situation to make the most just decision that I possibly can. While employment decisions remain confidential, I have attached fourteen of my labor decisions - with the permission of the parties - to this web site to give an indication as to my analytical technique and my decisions involving common issues in labor arbitration. All Rights Reserved. 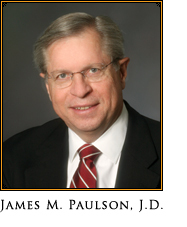 James M. Paulson.